Please do not be confused about what causes a gout attack. If you are confused about the cause, you will be confused about the treatment. Confusion prevents you from treating gout properly, and so your gout gets worse. By not treating gout early, you risk permanent joint damage, kidney damage, and many serious health problems, many of which are fatal. To avoid confusion, let me start by explaining what a gout attack is. Then I will explain reasons why gout happens. 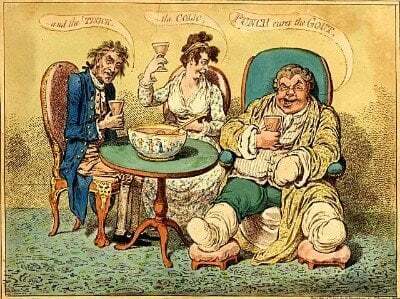 What Is A Gout Attack? A gout attack, also known as a gout flare, or acute gout, is a painful swelling of one or more joints. It usually starts in joints that are most exposed to low temperature. For the majority, this is in the bunion joint of the big toe. People who drive a lot tend to get the first attacks in the ankle. One ship captain wrote in the gout forum of attacks in the hip, as the position for steering that particular vessel meant the hips were most exposed. If work or lifestyle exposes particular joints, you might take steps to keep those joints warm. However, this will not stop gout spreading, and you will only slow down the progress of gout. Without treating the cause, gout will spread to all joints and other tissues. Gout attacks become more widespread, more frequent, and more intense. Gout attacks vary in strength. You only really notice them when the pain becomes significant, but between severe attacks, you are likely to have many small episodes, where numbness, tingling, or a dull ache are the only signs of gout. This does not mean your gout is better, it just indicates that uric acid crystals are growing very slowly. Many gout sufferers get confused about the reasons for gout attacks. People talk of ‘gout triggers,’ but this is largely pointless. There is only one cause of gout attacks – high uric acid. But there are many reasons for high uric acid. So there are many reasons why high uric acid can cause a gout attack. But trying to avoid gout triggers is pointless. Once you have high uric acid, there are too many things that can cause a gout attack. Trying to avoid them is like trying to avoid life itself. What you must do is understand how gout attacks happen, understand that the only controllable factor is excess uric acid, then do all you can to remove the excess uric acid. This way, you tackle the root of gout attacks, and with a few months patience, they simply cannot happen. The reason for gout attacks is an immune reaction to uric acid crystals. During that reaction, our white blood cells surround uric acid crystals. Once hidden in this way, uric acid crystals become invisible, and the painful swelling subsides. However, deposits increase with every attack, and so each day that uric acid is left untreated, more deposits form. Eventually, these will cause unsightly lumps under the skin. We can stop this process immediately by getting uric acid below 6mg/dL (0.36mmol/L). For safety, it is best to aim for no higher than 5mg/dL, which gives a margin to cover natural daily fluctuations. Though this simple process will stop any new crystals forming, we still have old uric acid crystals spread around our bodies. These can cause a gout attack as they dissolve. The best way to minimize this is to reduce uric acid as low as you can for several months. Combination pain relief, as advised by your doctor, will stop any gout pain during the early months of treatment. Within a few months of uric acid at safe levels, you will never get a gout attack ever again. Then you can stop worrying about what causes a gout attack. Although acute gout, gout attack, and gout flare are interchangeable terms for the same thing, I tend to use acute gout in the section about understanding gout. I use gout flare in the Gout Symptoms section and gout attack in the Gout Treatment section. Use the Understanding Gout guidelines to understand what acute gout is. Use the gout causes pages in the Gout Symptoms section to understand what causes a gout flare, and how it looks. Use the Gout Treatment section to learn how to control gout attack pain and stop gout attacks returning. Use the gout forum to share your experiences, opinions, and questions about your gout attack. Leave What Causes A Gout Attack to browse the Gout Treatment guidelines.